Eligibility: Youth ages 11-14. Adults may attend as chaperones. 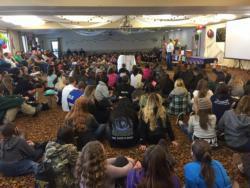 The Central Youth Summit is a three-day Area conference for youth ages 11-14. Participants attend a variety of educational workshops, listen to amazing keynote speakers, and have fun at recreational activities over the course of the weekend. Youth participants stay in 10-person dorms with at least one adult chaperon. While attending sessions, the participants are divided into groups of about 15-20 that are well-mixed to ensure that everyone has a chance to make new friends from all over California. The 2019 conference is still in its planning stages, so check back later for more details! The California 4-H Management Board is sponsoring fee waivers to the 2019 Youth Summits for up to two youth from each county. We want to make sure all youth, regardless of financial situation, will be able to attend a youth summit. To apply for a fee waiver, please complete the online fee waiver application form at least 30 days before the youth summit you wish to attend. Applicants will be informed within two weeks of their submission whether they will be awarded a waiver. Fill out A Medical Release Form (Youth | Adult) and send it to the County 4-H Office. Send your registration fee to the County 4-H Office; make all checks out to "Stanislaus County 4-H Council". Registration for each participant is $145.00. This includes lodging, meals, and all activity supplies. T-Shirts can be added for an additional $10.00 per participant. For registrations including t-shirts, please make out checks for $155.00.